The Last Kingdom is a British 60 minute scripted history television series, which kicked off on October 10, 2015, on BBC Two and is broadcast every at 21:00. The show is currently in its 3th season. BBC Two is yet to announce the renewal of The Last Kingdom for Season 4 as well as its cancelation. Sign up to track down the show's status and its release date. 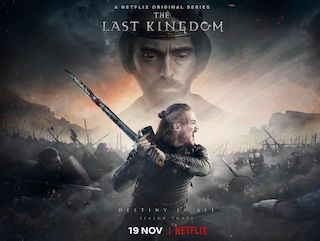 The Last Kingdom is a show of heroic deeds and epic battles but with a thematic depth that embraces politics, religion, warfare, courage, love, loyalty and our universal search for identity. Combining real historical figures and events with fictional characters, it is the story of how a people combined their strength under one of the most iconic kings of history in order to reclaim their land for themselves and build a place they call home.